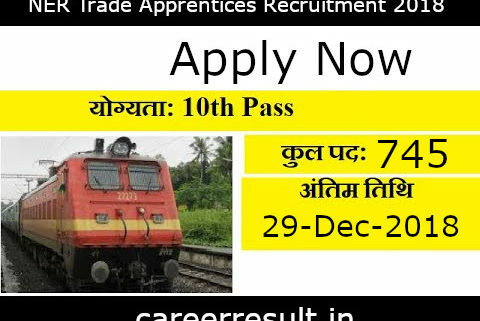 Northern Eastern Railway has invited application for the recruitment of Trade Apprentices during the month of November-December, 2018. There are total 745 posts were called for various ITI Trades. NER Gorakhpur has now evaluated the Marks obtained by candidates in their Matriculation Examination.Candidates can check and download their NER Apprentice Gorakhpur Result 2018 on careerresult.in. It is hereby informed that Railway NER Gorakhpur Trade Apprentices Merit List has been prepared; Candidates are required to check their Merit List/Result. Result will be in the format of PDF File; here candidates need to check their Details. In order to download their Railway NER Gorakhpur Trade Apprentice Result candidates are required to go to the important link section provided blow. After getting the link candidates need to click it for downloading their Railway NER Gorakhpur Trade Apprentice Result /Merit List (PDF). Candidates can also download their Result from official site of the Railway NER. Short Information :North Eastern Railway Gorakhpur (NER Gorakhpur) has published a recruitment notification for vacant posts of NER Trade Apprentices Recruitment 2018 on 29/11/2018. The notification is for recruitment of Trade Apprentice. Here you will get the complete information about NER Gorakhpur Trade Apprentice Recruitment online application form 2018. You will get here complete detail about NER Gorakhpur Trade Apprentice application procedure, important dates, application fees, age limit, qualification, number of vacancies, pay scale and important links. If you have any doubt regarding NER Gorakhpur Trade Apprentice recruitment online application form procedure you can ask us via comment form given below. How to Apply for NER Trade Apprentices Recruitment Online Form 2018 –Candidates can apply through link provided below or they can also apply through official site of the NER before 29/December/2018. Conclusion : For more detailed info regarding to Gorakhpur NER Trade Apprentices Recruitment 2018 kindly visit official website and read carefully employment advertisement before applying against to NER Railway Bharti 2018. SubscribeCareerresult to get latest updates about Gorakhpur NER Trade Apprentices Recruitment Vacancy 2018 on your smartphone via E-mail. All candidates have to request is to share this job link with your friends over at Whats App, Facebook ,Twitter,Instagram and help them get good career in your life. Career Result is the best website for NER Railway Vacancy notification in India. Career Result ensures that all the Jobs get notified to all our visitors. We ensure that no Jobs get missed out in our website. We help everyone include fresher and experienced graduates to get recruitment notification on recent NER Gorakhpur Trade Apprentice Recruitment 2018 . Career Result is a leading job website for NER Gorakhpur Trade Vacancy 2018. Here we provides the Latest recruitment notification from NER Gorakhpur Trade Apprentice Offline Form 2018. 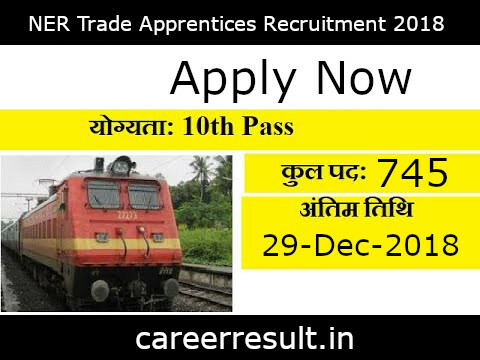 CareerResult team ensures to present all the recruitment notification and job openings from NER Gorakhpur Trade Apprentice Recruitment 2018 in this exclusive recruitment page for NER Gorakhpur Trade Apprentice Recruitment 2018 . This page contains all the active and recently expired job openings and recruitment notification from Gorakhpur Division Various Trade Apprentice Recruitment 2018.